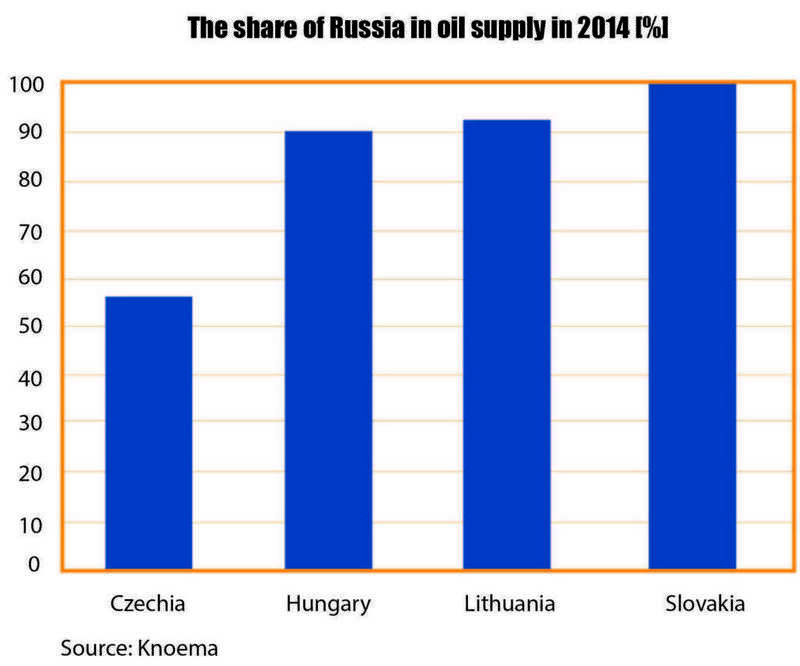 Russia still has supremacy over Central and Eastern Europe, especially over its crude oil market. However, Middle-East countries like Saudi Arabia, Iraq and Iran, have entered this traditional Russian trade because every oil producing country is searching for new markets and bigger market share regardless the price. Last year, oil from the Saudi Kingdom arrived in Poland for the first time1)Saudi starts oil supplies to Poland, in set-back for Russia, Source: Reuters 2015-10-13, and in August this year Iranian crude has come back to the Polish market after it has been absent for a couple of years2)Exclusive: Oil reshuffle in Poland – Urals out, Iran in, Source: Reuters 2016-08-12. Hungary, the second biggest export destination for Russian oil in the region, has increased the import of fuel from Iraqi Kurdistan3)Hungary imports oil from Iraq’s Kurdistan at expense of Russian crude: sources, Source: Reuters 2015-10-07, while Ukraine, the greatest adversary of Russia, is trying to become the gate to Eastern and Central Europe for National Iranian Oil Company4)Possible route for Iran oil to Europe through Ukraine revealed (exclusive), Source: Trend News Agency 2016-08-24. It appears that the energy supply security has increased in the region, but will oil from the Middle East be a real secure alternative to the Russian Urals oil? This summer Iranians shipped 2 million barrels of oil to Poland. The August’s arrival of the supertanker “Atlantas” to Polish port in Gdańsk was greeted as a political game-changer, just like the April’s opening of the new oil Terminal Naftowy PERN. 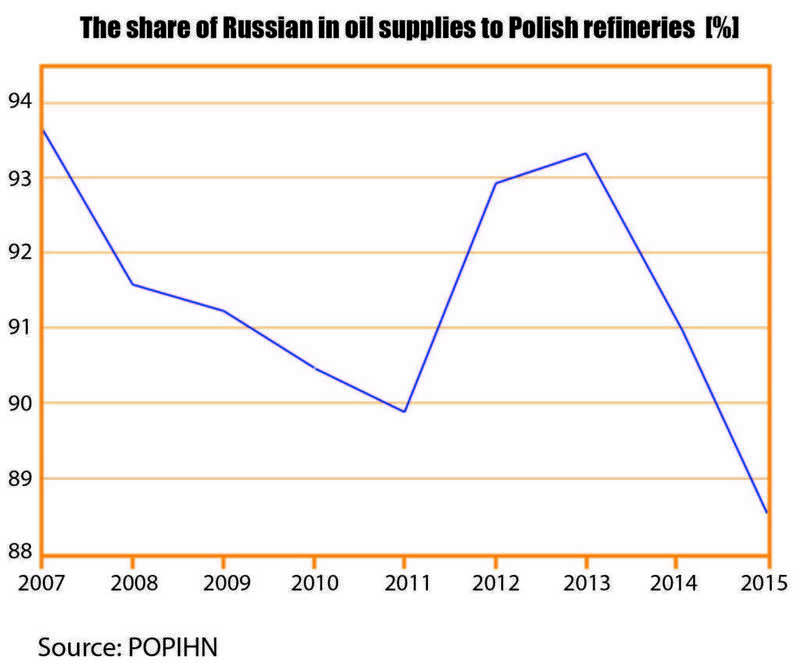 Polish and German refineries depend on Russian oil coming mainly through a pipeline from Russia. The Naftowy PERN Gdańsk Terminal allows Poland to import oil from other countries if oil supplies from Russia disrupt. The diversification of energy supply sources has always been the main topic in the political discourse in Central-East Europe and the arrival of oil from the Middle-East in Poland is important news. However, there are some temporary helpful conditions without which the import of Saudi or Iranian oil could not be possible; that may not last forever. First, the oil price is still low, as oil in storage is at record highs, every producer is trying to dump as much oil as possible into the market. Iranians are said to sell their crude twice cheaper than their competitors in Saudi Arabia and Iraq. Secondly, the cost of shipping is extremely low nowadays. 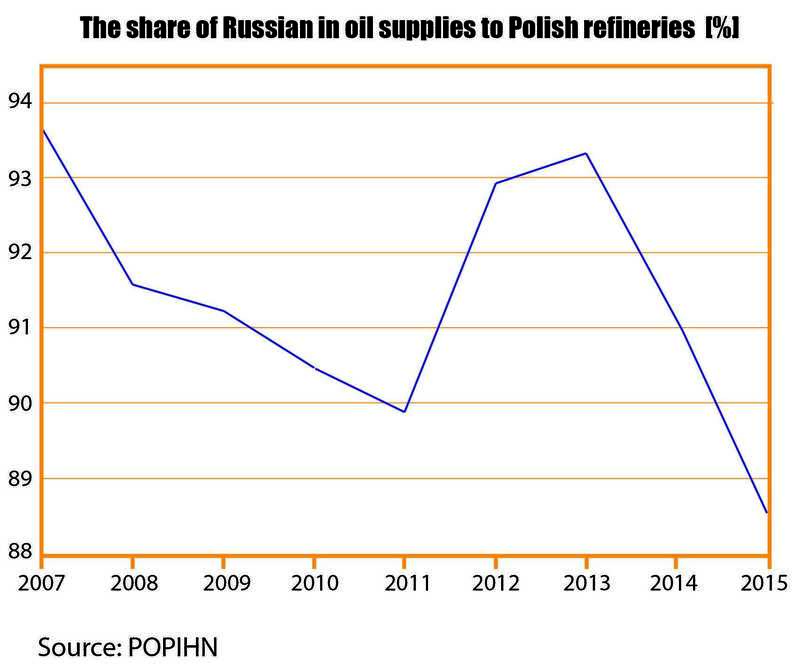 If shipping price increases and export of crude oil from Iran or other Middle-East countries to the Baltic Sea, not being profitable anymore, Poland will still be dependent on Rusian oil supply. The political situation in the Middle East is still escalating. Energy exposure to Iraq and Iran add new uncertainties to Poland’s energy security. The Baltic Sea has its limits, too. 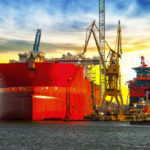 The supply of 2 million barrels of Iranian oil to Gdańsk is enough for only 3 to 4 days of Polish oil consumption. 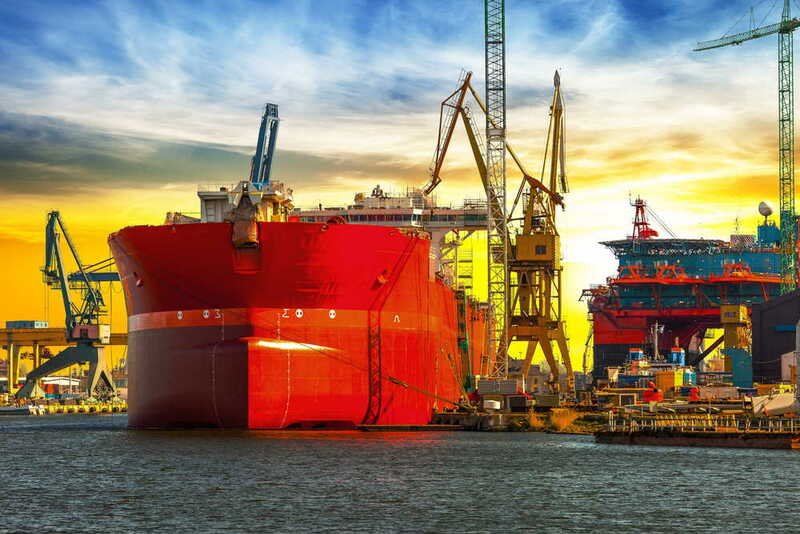 Two million barrels is a massive sea delivery for Poland. However, to achieve this, the “Atlantas” had to travel 22 thousand kilometres (half of the length of the equator), going around the Horn of Africa. Because of natural conditions in the Danish straits, 700 thousand barrels had to be reloaded into a second tanker “Calidy”6)Ropa z Iranu już w Polsce. Trwa rozładunek tankowców, Source: WP Money.pl 2016-08-15. Therefore, a permanent sea bound supply of large volumes of crude to Gdańsk seems a mirage. However, Iranian oil in Gdańsk is a signal to Russia, and they should be concerned, as they were last year when Poland receive its first oil supply from Saudi Arabia7)Saudi starts oil supplies to Poland, in set-back for Russia, Source: Reuters 2015-10-13. Oil export makes up 50% of the Russian federal budget, and Poland is the fifth biggest destination for Russian oil, after China, Germany, the Netherlands and Belarus8)Will Russia Survive the Oil & Gas Downturn?, Source: Oil & Gas 360 2015-10-15. Rosneft has long-term contracts for the oil supply with Polish refineries PKN Orlen and Lotos S.A., but Saudi Aramco signed the first ever long-term deal with PKN Orlen for oil delivery to Poland, Czechia and Lithuania9)Saudi Aramco enters Baltic market with key crude oil supply contract to PKN Orlen, Source: Saudi Aramco 2016-06-01. Before the signing of this contract last April, Saudis and Poles had only arranged spot contracts. The cooperation with Saudi Aramco has a better prospect than the agreement with Iran for geopolitical reasons: the government in Warsaw may prefer to support the US-ally House of Saud or may be forced to do so. Importing oil from the Middle East is important for Central-East Europe because it provides an alternative to the Urals and enhances the negotiating position with Russia. But yet, the Russian share in oil delivery to these countries will drop only by few percent.